Maison Daboval is offering special cooking classes with a two night stay. Learn how to make (and eat) an authentic Cajun meal. Martha and Gene will take you on a culinary journey - teaching the origins of the meal, ingredients, and cooking techniques that have been handed down through generations of great Cajun cooks. Packages include a two night stay, one cooking lesson and full breakfast each morning. Please call for availability and prices. 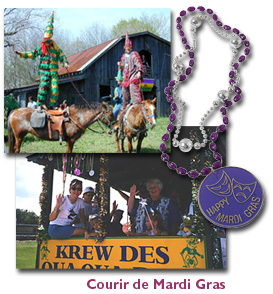 Experience Courir de Mardi Gras in the heart of Cajun Country on Sunday, February 22, 2009. 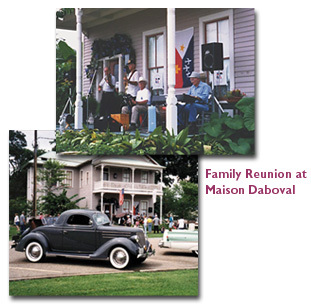 Stay at Maison Daboval and enjoy all the Mardi Gras festivities in the surrounding areas. Call for more information about Mardi Gras. 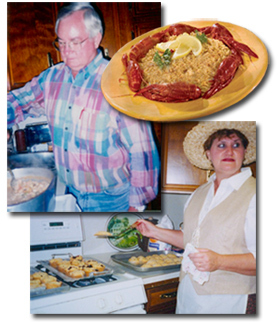 Special events such as Poetry on the Prairie, workshops, family reunions are ideal at the Bed and Breakfast. Call Martha Royer to discuss details about your upcoming event.